Gotta love those names. 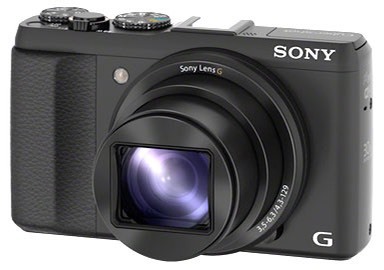 DSC is a thirty-year old abbreviation for "digital still camera," but apparently Sony, who never made a still camera, thinks that that still needs to be in their product names. As to the product, the reason why I mention it is the HX50V represents another of the camera makers' attempts at trying to find some traction in the slippery slope of declining compact camera sales. The key element here is the 30x zoom, basically a Zeiss-designed 24-720mm f/3.5-6.3 equivalent lens stuck onto a shirt pocket camera. If that weren't enough, Sony has crammed 20.4mp into the 1/2.3" BSI sensor. But Sony didn't stop there, they also squeezed WiFi and GPS into the US$450 camera, added an optional EVF, gave it a 10 fps burst mode (unfortunately only for 10 shots), and made sure it had all the other usual Sony-esque stuff (1080P/60 video, sweep panorama, image stabilization, etc.). Amazingly, the list is so long that Sony barely mentions the built-in WiFi on their Web site. It's not mentioned on the Overview, Features, or Specifications tabs on their Web page as I write this. Of course Sony isn't the only one playing this game. The 16mp Fujifilm F900EXR introduced in January has a 25-500mm lens and phase detection autofocus, the 12mp Canon SX280 HS is also 25-500mm, the 18mp Nikon Coolpix S9500 sports a 25-550mm lens, the 16mp Olympus SH-50 is 25-600mm, and the Panasonic Lumix DMC-ZS30 is 24-480mm. But Sony seems to be trying to take the "stuff it 'til it sells" approach to new heights. Basically, this is the "kitchen sink" approach to product definition, as in "throw in everything, including the kitchen sink." Surely the smartphone camera users must find something in this huge checklist of features that makes them want to stop using their phone as their camera and carry a compact, too, right? I have a hard time believing these so-called "travel cameras" are the "future" that will save the camera companies. The combination of small sensor, low mass, long lens—even with optical stabilization built-in—just doesn't seem like a truly winning choice. There's just too much possibility that the results when products like this are pressed to their extremes by the purely amateur market are going to be less than impressive. The Sony name used to be associated with "quality consumer electronics." The problem I have with their direction lately is that they're trending more and more towards "gimmicky consumer electronics." This, of course, is one of the problems with high tech businesses. If you establish a category and a reputation at the top of a category, you get continually undercut by low-cost producers trying to bring "close enough" quality down to much lower prices where they get the customer instead of you. The impulse is to try to beat these commodity-pushers in two ways: (1) follow their lead but out produce them; and (2) add gee-whiz gizmos to your product faster than the cloners can copy them. The correct action is to push quality even higher up and drive complexity down, something that Apple has been living off of for some time now. The HX50V won't be available until around the July 4th holiday, so it's too early to make a call on whether the camera actually delivers beyond expectations. But my expectations aren't all that high at the moment.